Adding valve circuitry to the X1 offers a slightly different but pleasant tonal perspective. Airy top end. Low self-noise. Metal carrying case. Twice the price of the X1. 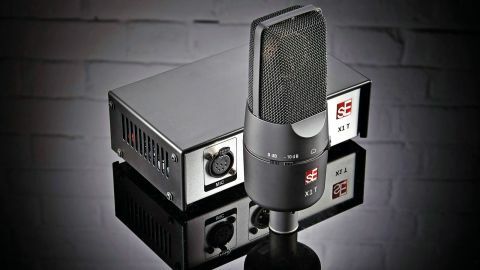 The original X1 large diaphragm condenser mic was launched by sE in 2009 as an affordable mic to take on the likes of Rode's NT1A and other contenders in the entry-level price bracket, offering a handcrafted capsule rather than the off-the-shelf capsules other companies were using. Since then there have been other versions of the X1 - the X1R ribbon mic, the X1 USB for plugging straight into a USB port, announced at the NAMM show in January, and, also launched earlier this year, the X1D kick drum mic and the X1T valve mic that we are taking a look at here. "The X1T features the same handcrafted, gold-sputtered capsule as the original X1 but pairs it with analogue valve circuitry"
The X1T features the same handcrafted, gold-sputtered capsule as the original X1 but pairs it with analogue valve circuitry. Unplugged, the actual microphone looks pretty similar to the X1, only the X1T legending on the trademark black finish giving the game away. But when plugged in and up and running you immediately see the difference. Valve mics require their own power supply and here this takes the form of a rectangular black box that the mic connects to with a 7-pin cable that is around five metres long, allowing you to keep the power supply well away from the mic. The power supply is switchable between 115 and 230 volts so you can use it anywhere in the world. It connects to the mains with an IEC lead and features a standard XLR output socket for audio. Mic, power supply and power lead all come in a smart aluminium carry case along with a standard mic clip - if you want a shockmount cradle, sE points you in the direction of its Isolation Pack (£46.80) shock mount and pop shield set. The X1T features a fixed cardioid polar pattern but has switching for a bass-cut filter which kicks in around 80Hz and a 10dB pad for use with louder sound sources. On powering up, the first thing we noted was that the mic was quiet. So far so good... we checked it out on a male vocal and found a pleasant sound with the slightly warmer low mid-range, that you'd expect from a valve mic, imparting a reassuring solidity. There was also plenty of detailed breathy top-end. The sound is in fact very airy; there's a definite lift in the top-end above 10kHz, although it's not overdone. That brighter character worked well when recording a range of acoustic guitars, where the sparkle and zinginess of the strings came through loud and clear. We also got the chance to use the mic on hand-held percussion and got really good results on tambourine and shaker. Overall, the X1T is, as you might expect, very similar in character to the original X1 but the valve in the circuitry offers a shift in the tonal perspective that some users may prefer, particularly if they are looking for a smooth, airy vocal sound. It's always good to have a valve mic in the cupboard to give you something different from your standard condenser and the X1T gives you that option in a handy package that's reasonably affordable - at least in comparison to sE's high-end valve mics like the Gemini II. We'd have liked a cradle mount to have been included, as it would have made sense to have all the necessary components in the same carrying case but the isolation pack at a street price of £39 won't break the bank and, as expected retail price is around £229, the whole lot should clock in below £270. That's about twice what you'd pay for an X1 with the isolation pack - but if you really like the sound, that valve character may be worth the difference.